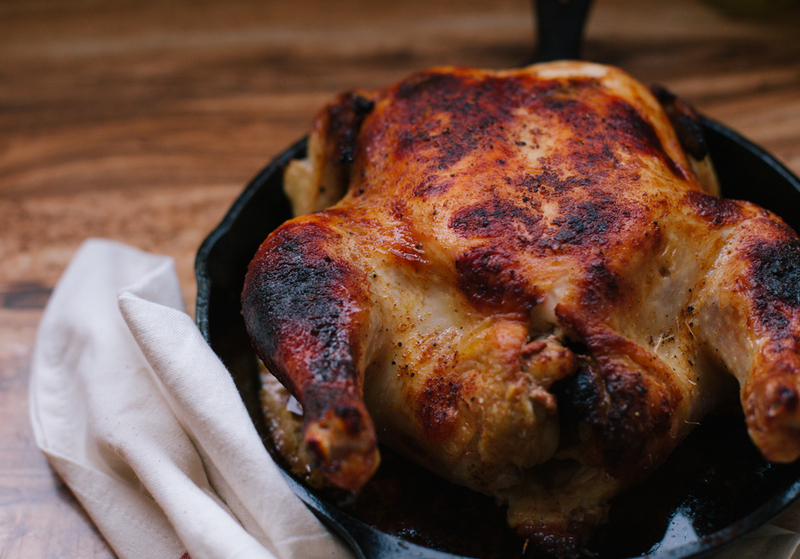 I’m really excited to finally share one of my favorite roast chicken recipes with you today! It’s pretty much one of my go-to recipes whenever people or over, or I just want to eats something DELICIOUS without needing to experiment much. When I first began researching roasting chickens, it was a little daunting. Not only do I despise dry chicken, there were all these techniques like “trussing” and “spatchcocking” that I had never done before either. I also spent extensive time reading about wet brines vs. dry brines, if it’s necessary, and what’s the perfect way to cook it. On the other hand, I read multiple recipes where you didn’t have to do any prep work– just rub some herbs on it and pop it in. 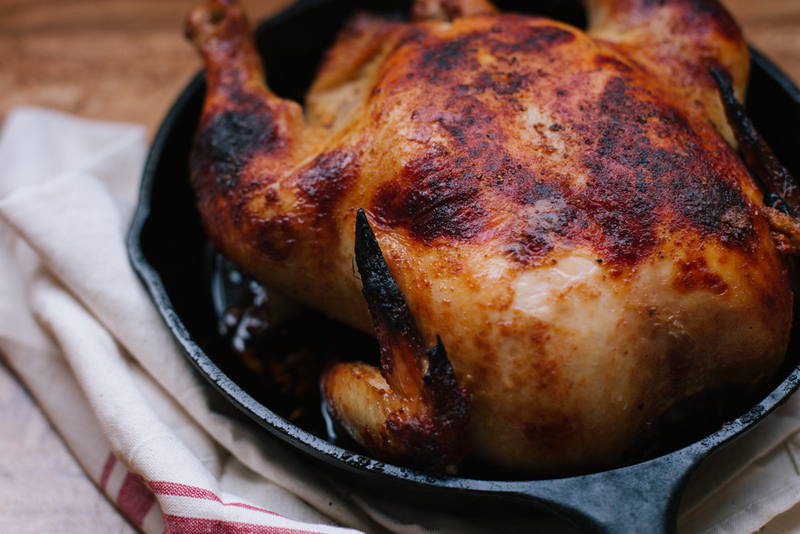 After many, many roast chickens, I’ve narrowed down the recipes to a few select favorites. 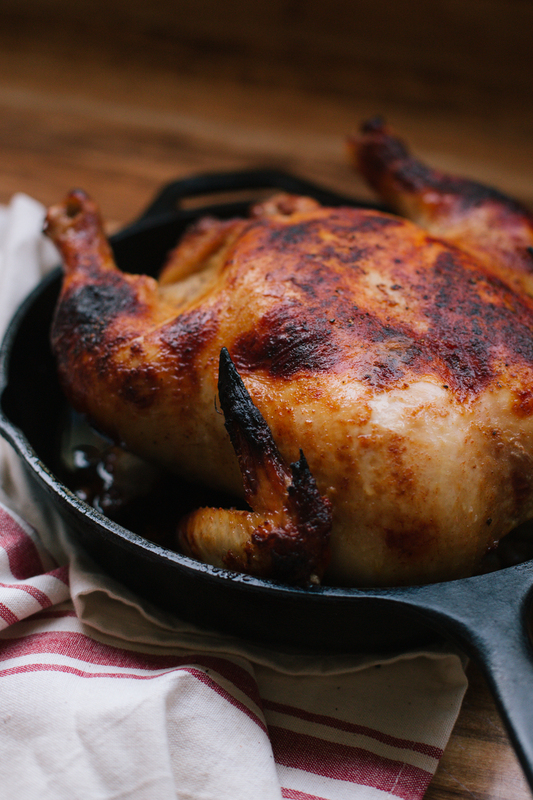 One of them is this– a buttermilk roasted chicken. 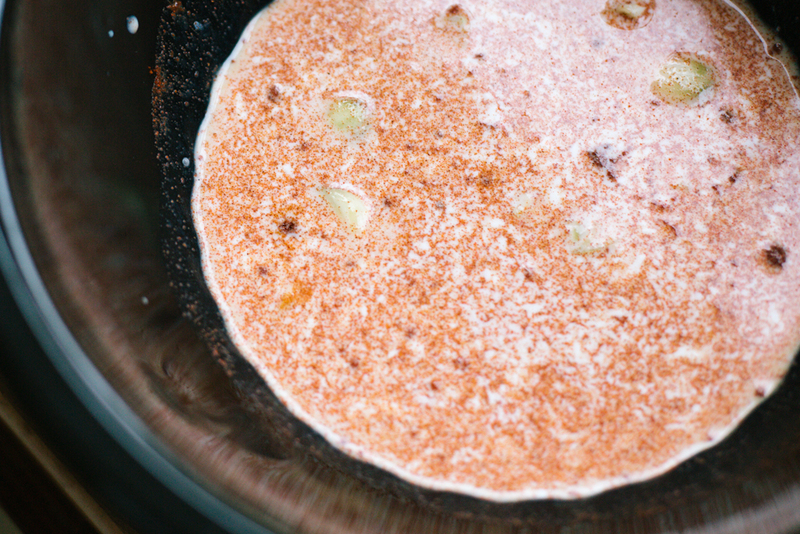 Inspired by Nigella Lawson, it sits in a buttermilk bath overnight, seeping in spiced paprika and garlic. It’s perfect for a quick weeknight dinner that you can easily pop in the oven then do other things, like play with your adorable fluffy dog named Buttah. I also end up making a nice potato hash by frying it up in the leftover chicken fat. WIN! *Note: Ideally, the chicken would marinate overnight so accommodate for that. The night before, mix together the buttermilk, garlic, salt, sugar and paprika. Top with freshly ground pepper. If you don’t have enough buttermilk lying around, you can substitute with milk or yogurt. (One time I ran out of buttermilk, and used 1 cup buttermilk and 1 cup milk.) Put the chicken in and marinate. If the chicken isn’t fully submerged, make sure to flip it halfway during the marinating time so both sides get marinated. When you’re ready to roast the chicken, preheat the oven to 450 degrees F. Take the chicken out of the marinade and let it sit at room temperature for about 15 minutes. 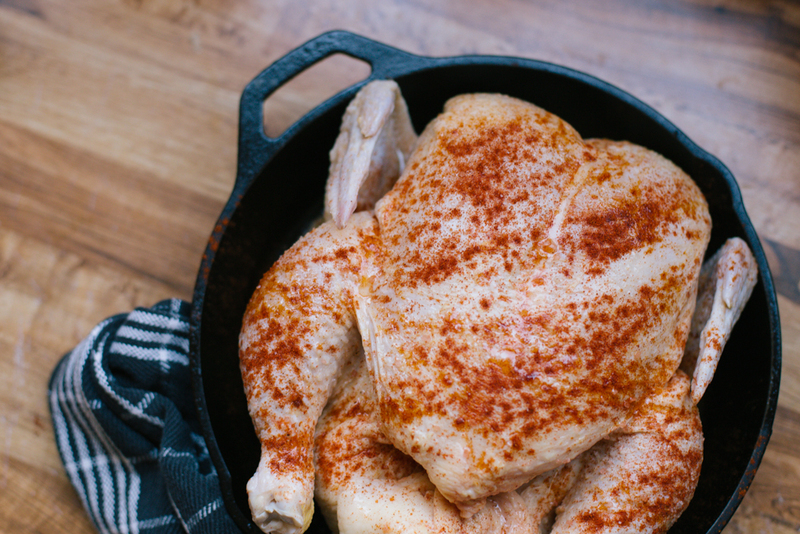 In the meantime, if you’re using a skillet, heat it to medium and place the chicken on it, breast side up. Then turn off the stove and remove from heat. This adds a nice sear to the chicken makes it less likely to stick to the pan later. Drizzle olive oil on top and sprinkle some more paprika and black pepper. If you’re not using a cast iron skillet, just drizzle and sprinkle without heating it on the pan first. Put the chicken into the oven. You should hear a little bit of sizzling and it should begin browning within 20 minutes. If it starts to look like it’s burning, turn down the temperature by 25 degrees. After 30 minutes, flip the chicken. Let it roast for another 25 minutes. Finally, flip it one more time to crisp up the other side for about 5 minutes. Use a meat thermometer to measure the internal temperature- it should reach 160 degrees. If not, roast it in 10 minute intervals until it reaches that temperature. Let the chicken rest for 15 minutes before cutting and serving! 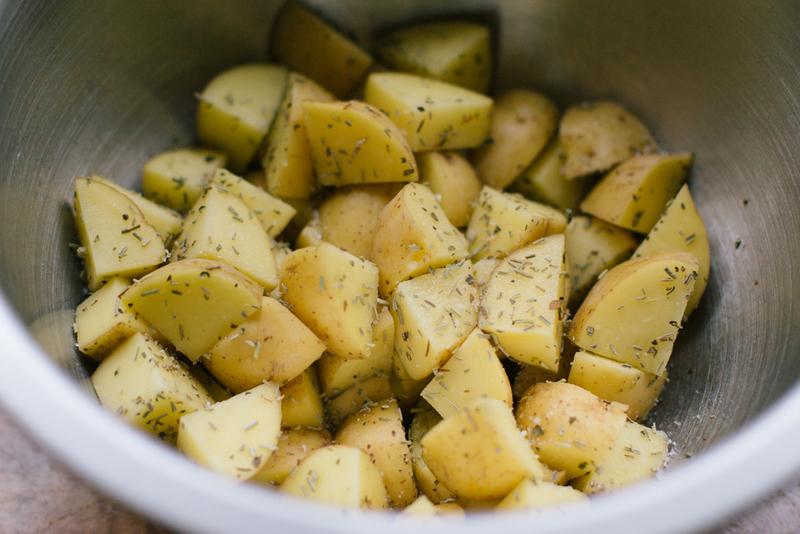 *If you’d like to add potatoes, chop up Yukon Gold potatoes evenly and sprinkle with rosemary and salt. Then, after removing the chicken, keep the fat and fry the potatoes in the fat until browned. Before serving, let the fat drain from the potatoes by putting them on a paper towel to dry.